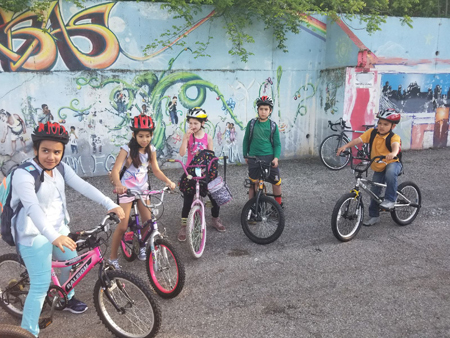 Rosedale Development Association organized activities for students to celebrate National Bike to School Day. 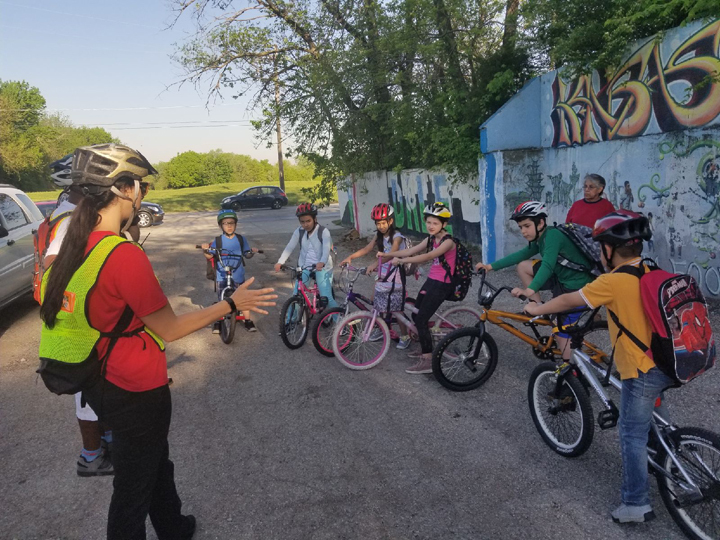 Biking to school can be intimidating, but not on Walk and Roll to School Day! 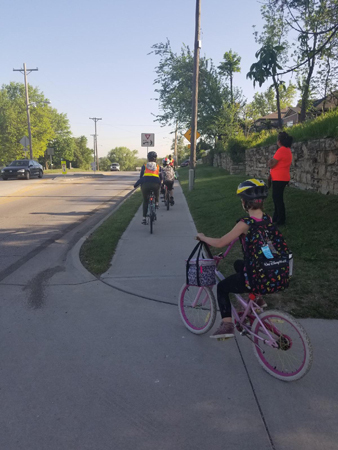 On Wednesday, May 9, approximately 50 students at two Rosedale elementary schools made their way to school in a noisy parade of friends, parents, teachers and neighbors. Rosedale Development Association (RDA) has worked with Frank Rushton and Noble Prentis Elementary Schools to organize Walking School Buses for seven years. Once a week in good weather, students, parents, and teachers meet in the neighborhood and walk a one-to-two mile route to school. 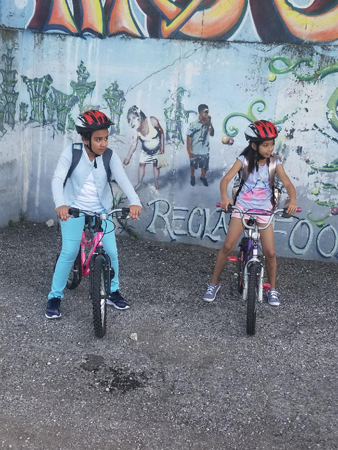 On special days, such as today’s Bike to School Day or International Walk to School Day in October, students kick off their walk with snacks, games, and even music at the meet-up spot. 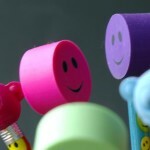 Our partners provide invaluable information and supplies that help make the day fun and safe. 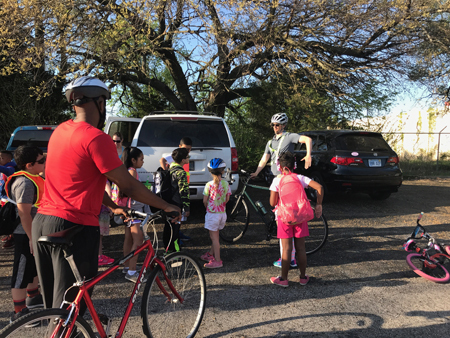 BikeWalkKC partnered with Rosedale Development Association and Rosedale schools to provide information on safe walking and biking, as well as fun prizes and activities for kids who walk. 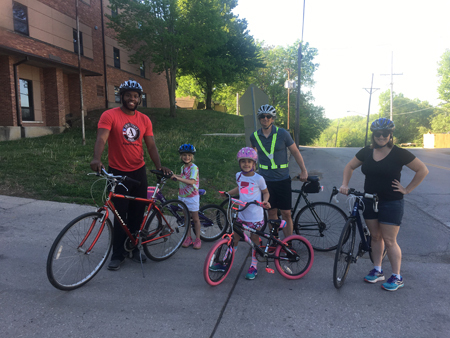 The Brain Injury Association of Kansas and Greater Kansas City provided helmets to make sure everyone is riding safely. Rosedale is one of many neighborhoods in Kansas City with missing and damaged sidewalks, which make it harder for kids to walk safely. 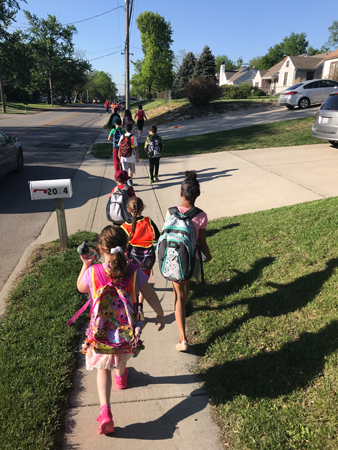 Walking School Buses have drawn public attention to the need for sidewalks along the most common walking routes to schools. Both Frank Rushton and Noble Prentis were chosen to receive National Safe Routes to School funding to build new sidewalks along highly-used walking routes. During the last seven years local government also designated additional funding to build badly-needed sidewalks on Mission Road and 42nd Ave., part of the Frank Rushton walking route, and 14th St., part of the Noble Prentis walking route. Now kids can be seen daily walking and rolling to school on new, well-maintained sidewalks. Multiple studies have found that children who walk to school are more active throughout the school day;   and that children who get more physical activity show improved academic performance. 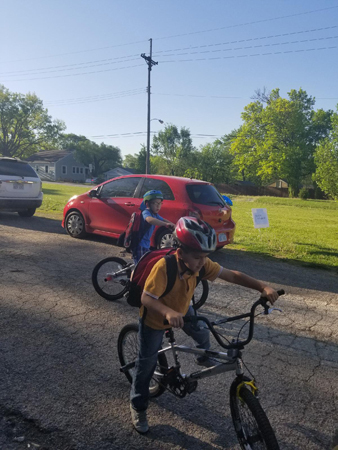 Walking and biking to school is an opportunity for kids to connect with friends and neighbors. 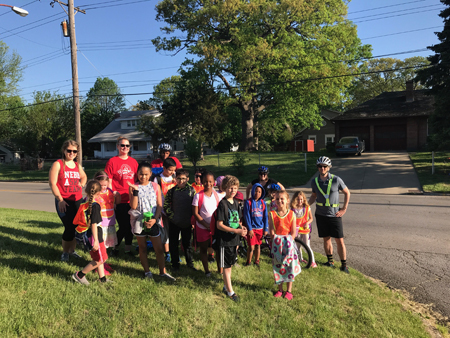 In Rosedale, walking and biking to school also creates an opportunity for kids and teachers to notice issues in the neighborhood and talk about ways to address them — like the pile of trash dumped along one Walking School Bus route that was reported to RDA and cleaned up during a neighborhood cleanup day shortly after. 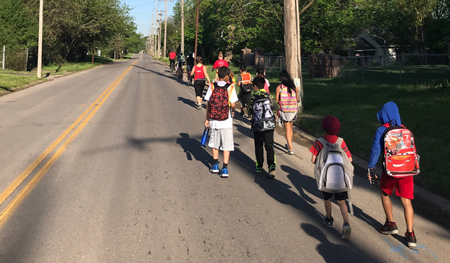 Walking School Buses and events like Walk and Roll to School Day help build a neighborhood culture of walking, biking, staying connected, and looking out for your neighborhood. 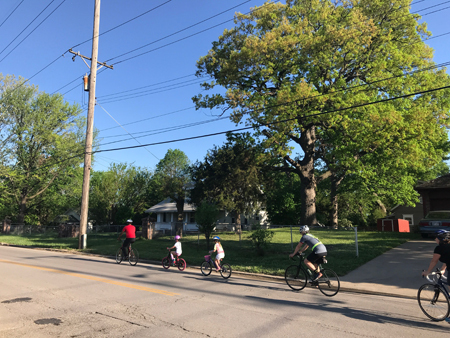 May 15, 2018: RDA will host Bagels on the Boulevard, with breakfast available for anyone walking or biking to work on Southwest Boulevard along the first mile of bike lanes to be installed in Kansas City, KS. 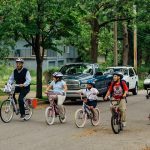 May 17, 2018: Everyone is invited to the 8th Annual Bike-In Movie, held at the Boulevard Drive-In Theatre, for bike-themed activities and a viewing of The Sandlot. 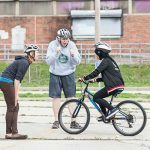 Check out http://kcbikemonth.com/events/ for a full list of Bike Month events in the metro area. Follow Rosedale Development Association on Facebook and Instagram, or visit their website at http://rosedale.org. Mendoza JA, et al. “The walking school bus and children’s physical activity: a pilot cluster randomized controlled trial.” Pediatrics. Sept 2011. Alexander et al., “The broader impact of walking to school among adolescents.” BMJonline. Cooper et al., “Commuting to school: Are children who walk more physically active?” American Journal of Preventative Medicine 2003: 25. California Department of Education. “A study of the relationship between physical fitness and academic achievement in California using 2004 test results.”.